Feefo ATLANTIC COAST AUGUST 3RD PET PREMIUM HOLIDAY HOME Service rating : Lovely clean tidy site, and friendly helpful sta. Product: Beautiful caravan, we felt very welcome and the dog was fine too. So oen it is diicult to accommodate the dog but this site was lovely. GARREG GOCH 4TH AUGUST PET PREMIUM HOLIDAY HOME Service rating : first class in all aspects Product: A1 in all ways PAKEFIELD - AUGUST 6TH PLATINUM 3 BEDROOM Service rating : Superb site, well impressed. 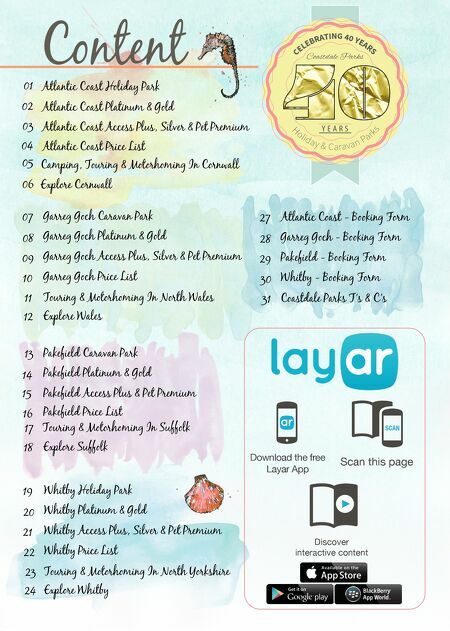 Product rating : Amazing value GARREG GOCH - JUNE 16TH TOURING Service rating : We loved this site....- clean and quiet...we will definitely be returning. 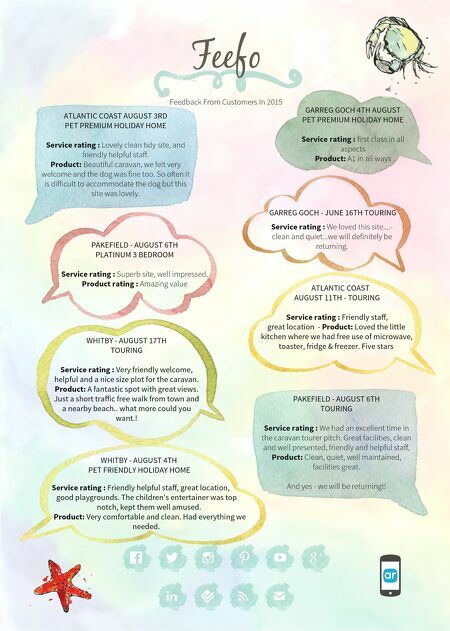 Feedback From Customers In 2015 PAKEFIELD - AUGUST 6TH TOURING Service rating : We had an excellent time in the caravan tourer pitch. Great facilities, clean and well presented, friendly and helpful sta, Product: Clean, quiet, well maintained, facilities great. And yes - we will be returning!! ATLANTIC COAST AUGUST 11TH - TOURING Service rating : Friendly sta, great location - Product: Loved the little kitchen where we had free use of microwave, toaster, fridge & freezer. Five stars WHITBY - AUGUST 17TH TOURING Service rating : Very friendly welcome, helpful and a nice size plot for the caravan. Product: A fantastic spot with great views. Just a short traic free walk from town and a nearby beach.. what more could you want.! WHITBY - AUGUST 4TH PET FRIENDLY HOLIDAY HOME Service rating : Friendly helpful sta, great location, good playgrounds. The children's entertainer was top notch, kept them well amused. Product: Very comfortable and clean. Had everything we needed.